Split strangely down the middle and bending towards the ground on both sides, this spooky apple tree spotted in Montreal, Quebec looks like something out of a twisted fairy tale. The strangler figs which are eating away at the walls of Cambodia’s beautiful Angkor Wat Buddhist temple look ready to devour anything in their path, including slow-moving tourists. 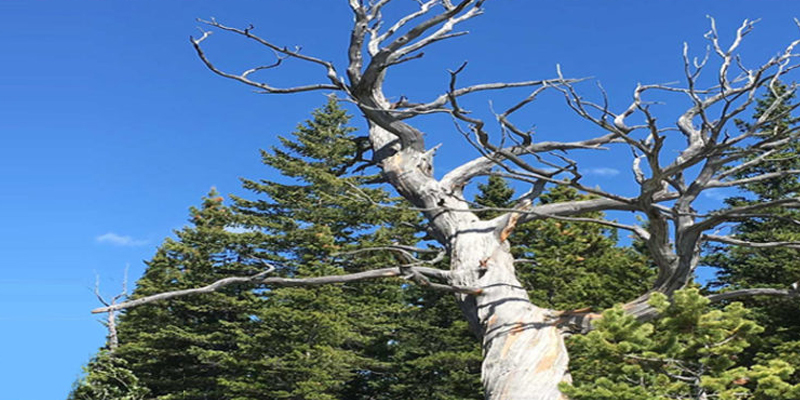 The Burmis tree located in south western Alberta is unusual due to the fact that it died in the 1970s and is still standing tall with no signs of rotting. Many believe this tree to be haunted but the locals refuse to let it go. In 1998 when heavy winds knocked it down the locals rallied together to prop it back up. You’d probably feel your heart racing if you encountered this screaming face in the trunk of a tree at Hither Hills State Park in New York. Cemeteries are scary enough already, but this dark, twisted, knotted tree looming over the Mount Auburn Cemetery in Cambridge, Massachusetts brings an extra sense of foreboding to the atmosphere. Take a walk or a drive through Ontario and you might come across this gnarled old tree. Very weather-beaten and oddly reminiscent of a face, it’ll likely send shivers down your spine. Halloween may be just around the corner, but that’s no reason to leave a frightening eyesore of a tree to loom over your property and scare away all the children. ArborCare Tree Service Ltd. has been providing tree removal, tree pruning, tree care, tree trimming and tree fertilizing services for our clients in Western Canada for over 30 years. If you have a tree on your property that could rival some of the scary trees on this list, then don’t hesitate to get in touch with us. We’ll make sure that the only thing that’s scary about your lawn this fall are your Halloween decorations.